Funeral services for Caleb Andrew Mincin, 4 months, will be 1 pm Thursday September 13, 2018, at New Zion Baptist Church, with Rev. Tommy Basco and Rev. George Bates officiating. Interment will follow in New Zion Baptist Church Cemetery under the direction of Gill First National Funeral Home. Visitation will be 5 – 8 pm Wednesday September 12, 2018, at the church. 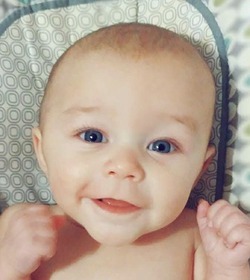 Caleb was born April 20, 2018, in Baton Rouge to the union of David Lee Mincin II and Jessalyn Alane Thornton Mincin and passed from this life on September 7, 2018, at Lane Regional Medical Center in Zachary. He is preceded in death by his maternal grandmother, Gaydene Thornton. Survivors include his parents, Dave and Jessalyn Thornton Mincin; brother, Carson Mincin; sister, Claire Mincin all of Baton Rouge; grandparents: Donald “Pawpaw” Thornton of Winnsboro, Colleen “Nanna” and Leonard “Buck” Buckner of Baton Rouge; aunts and uncles: Jeffery Thornton and Jakki Thornton both of Winnsboro; Christan Crawford, Mechelle Reid, and Jamie Harding all of Baton Rouge; beloved caregivers: Tina Prather, Kathleen “Mawmaw” Gremillion and Megan “Mae Mae” Ott; and a host of other relatives. Pallbearers will be Jabe Crawford, Jamie Harding, Landon Smith, Daniel Thompson, Adam Thornton and Jeffery Thornton. My heartfelt sympathy to each of you. No other pain will ever be greater than the pain of losing a child. Our heavenly Father knows the difficulities you are facing. Through his Word he helps us to understand why death occurs and what he will in the near future do to rectify the grief that we undergo due to losing our loved ones to this aged-old-enemy (death).